Does your law firm’s website bring you clients? 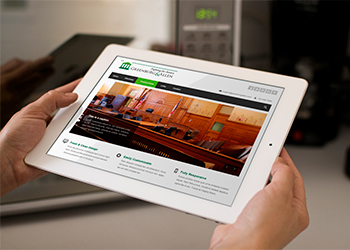 Just having a website isn’t enough for law firms in our competitive environment. It must have strong content to be found and favorably ranked by the search engines – Google, Yahoo, Bing, etc. It must provide the right information – in a compelling format – to convince the reader to contact your law firm. It must be responsive and adaptive. Having one without the other is fruitless – you have to achieve all. Websites created by BARD Marketing do that. Essential features for Lawyer and Law Firm websites. No law firm can afford to ignore the fact that more than a billion people primarily access the Web from mobile devices. Firms today need to have websites that are responsive and smart device friendly (can be accessed and seen on all platforms – phones, tablets, computers, etc.). If your Web page doesn’t display well on them, you’re losing customers. Many consulting firms charge big bucks for “SEO” service. But it doesn’t have to be rocket science or cost an arm and a leg. We know how to do it, and incorporate SEO techniques for all of our client websites. Our content is designed to be easily updated, be keyword rich, and contain relevant metatags, along with having other SEO techniques applied. Providing the correct information on your website for the intended audience is another issue altogether. On average, 2 out of every 3 people who click to a law firm’s website click out within 30 seconds….off to a different attorney’s website. As a marketing firm experienced with the legal profession, and one that understands strategy, we know what types of information visitors want from a law firm website– and how to set you apart. Content shouldn’t be generic. It’s not “one-size fits all.” With BARD, your website content is custom. SEO, banner ads, and ad words all help to ensure that your law firm’s website is found on Google, Yahoo and the other search engines. Blogs, web videos, social media and other techniques enhance your website to improve the user’s experience and encourage them to call your law firm. DAO is the next step in marketing your firm on the net. Whereas SEO focuses on optimizing your website, DAO is focused on optimizing all of your content on the web, including press releases, images, blog posts, and videos, regardless of where they reside on the web. DAO will help your firm be found even if those searching for your services don’t find your firm website. Completely Branded – Convey the right image and be true to your law firm’s brand. Content Rich – We’ll help identify and write content, so your attorneys spend time doing what they do best – practicing law. Easy to Maintain – Updates to your website can easily be made with our content management system (CMS) by your lawyers or staff…no waiting for your website provider to post new content. Differentiated – Get a top-quality website that’s not ‘cookie cutter’ and doesn’t look like other attorney sites. It is unique to your law firm. Affordable – Your new, effective site comes at a lower price than the ‘templated’ law firm website providers. Bar Compliant – We make sure your law firm website conforms to your State Bar attorney advertising regulations. At the Forefront of Technology – Sites built to be responsive and work on any platform. Contact us to request a FREE DIAGNOSTIC of your existing website or to discuss improving your website performance. See our glossary for an explanation of website and other marketing terms. For other important aspects of web marketing and attorney websites to consider, see our Hot Topics blog.